Ben and Alicia are still in 3 enjoying the sights when Ben hears an explosion. Investigating, he finds two crooks who are blasting open the secret locations of map plates which would lead to a long lost treasure. As the Thing tries to round them up, he is attacked by the newly revived Spider-Woman, who is once more loyal to Hydra. She has come to terminate Ben, however, at the last moment she chokes and is later forced to flee. Returning to Hydra headquarters she angers her superiors but promises to kill Ben Grimm next time. 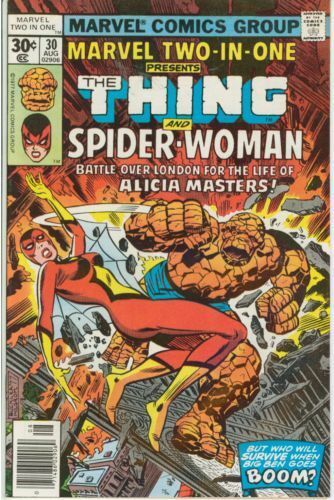 Later, while sight-seeing, Ben and Alicia are once more attacked by Spider-Woman, who kidnaps Alicia and flies off. Ben chases after her but runs amok of the same crooks trying to uncover yet another piece of their treasure map. Ben fights through them and picks up his trail on Spider-Woman, which takes him to Big Ben, where the two battle it out. Although Ben has superior strength, he's no match for Spider-Woman's speed and venom blasts. However before a victor can be made, the two crooks -- also at Big Ben to find another part of the map, capitalize on the battle to try and eliminate Ben, and so they detonate a bomb which knocks both Thing and Spider-Woman into the Thames River.